A black and white negative of Margaret Frost standing in front of hydrangea plants. In this view she is holding hydrangeas in her hand and she is smiling at the photographer. 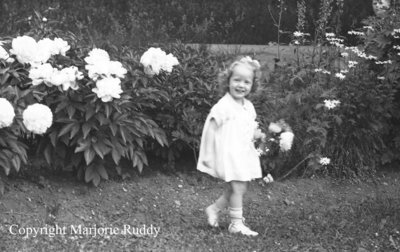 Margaret Frost, June 1939, Marjorie Ruddy. Whitby Archives A2013_040_807B.